For young Americans in the dating scene, a new epidemic has emerged – digital dating abuse. 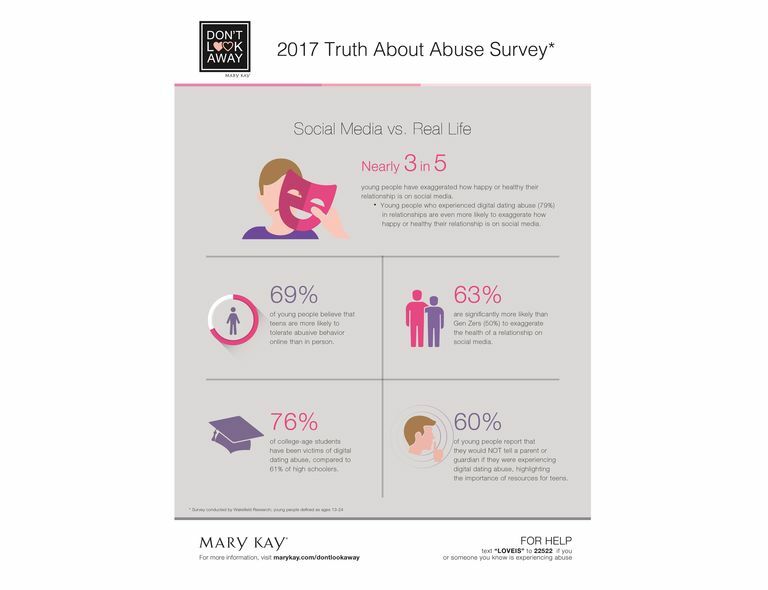 Today, Mary Kay released data from its eighth annual Truth About Abuse Survey which reveals that more than 1 in 4 (27%) of young Americans report they have personally experienced digital dating abuse and another 39% know someone who has. DALLAS – Oct. 18, 2017 – While many paint a picture-perfect life on social media, one of the dangers is that it helps hide traditional warning signs of abuse. Today, Mary Kay released new data from its eighth annual Truth About Abuse Survey which reveals that nearly 3 in 5 (59%) young people report they’ve exaggerated how happy or healthy their relationship is on social media and young people who experience digital dating abuse (79%) are even more likely to hide behind the façade. 69% of young people believe that teens are more likely to tolerate abusive behavior online than in person. 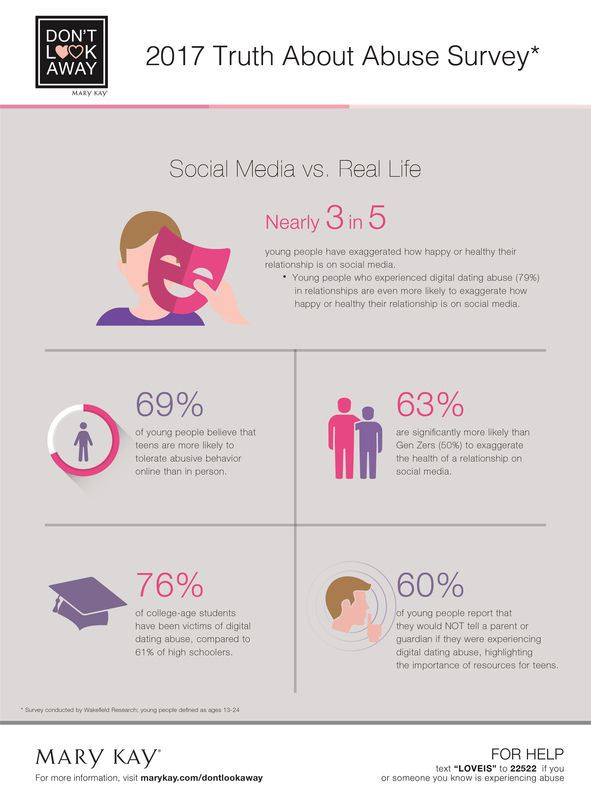 60% of young people report that they would NOT tell a parent or guardian if they were experiencing digital dating abuse, highlighting the importance of resources for teens. 63% of Millennials are significantly more likely than Gen Zers (50%) to exaggerate the health of a relationship on social media. 76% of college-age students have been victims of abuse, compared to 61% of high schoolers. For young Americans in the dating scene, more than 1 in 4 (27%) young people report they have personally experienced digital dating abuse and another 39% know someone who has. The 2017 survey is part of Mary Kay’s Don't Look Away campaign which works to educate the public on recognizing the signs of an abusive relationship, how to take action and to raise awareness for support services. In partnership with Wakefield Research, 1,000 young people ages 13-24 nationwide participated in the survey as a representation of America’s young population. To date, Mary Kay Inc. and The Mary Kay Foundation℠ have given $57 million to domestic violence prevention and awareness programs in an effort to end the cycle of abuse. At Mary Kay, success lies in our dedication to irresistible products, a rewarding opportunity and positive community impact. For more than 54 years, Mary Kay has inspired women to achieve their entrepreneurial goals in nearly 40 countries. As a multibillion-dollar company, we offer the latest in cutting-edge skin care, bold color cosmetics and fragrances. Discover more reasons to love Mary Kay at marykay.com.